I love spinach and zucchini, and this is a perfect way to get the best of both! 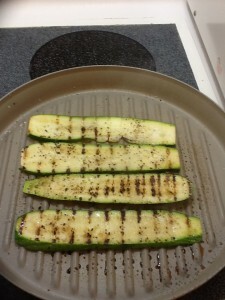 I used my indoor grill pan, but you can easily grill the zucchini outside also. This recipe for grilled zucchini rolls with spinach and feta serves 4 people (2 rolls per person). 1. In a small bowl, mix together the feta cheese, minced up parsley leaves, and lemon juice. Mash this all together until it is well combined. Set it aside. 2. Discard the outermost slice of zucchini. Then slice the rest of the zucchini into lengthwise slices about 1/4″ thick. You should be able to get about 4-5 slices from each zucchini. Preheat your grill or grill pan to high heat. 3. Salt and pepper both sides of each zucchini slice and place them on the grill pan. Turn after about 4 minutes, and repeat for 4 minutes on the other side. You should have nice grill marks on both sides. 4. Take each piece of grilled zucchini and at one end of the zucchini, stack up about 4 or 5 spinach leaves. On top of the spinach leaves, put a 1/2 teaspoon of the feta mixture. Then top it off with a small basil leaf. Roll it up with the seam side down. Repeat with all the zucchini. Eat right away while they are warm. Your guests will love these vegetable rolls. It is also a fun way to get your children to eat their vegetables. Let your children roll up their own to make it fun. You will be so happy when they ask for these again. There are variations you can do with the cheese. I prefer feta cheese, but if you like goat cheese, that is a good alternative. You can also choose the amount of cheese. I am always looking for new ways to enjoy the vegetables I love. The basil in this recipe gives it just a hint of spiciness that I like. Don’t just steam your zucchini tonight. Grill it with this extra bit of effort, and everyone will enjoy it! If you like this recipe, you should also try our recipe for vegan vegetable fried rice which has zucchini in it! 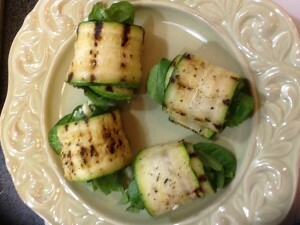 I LIKE this Grilled Zucchini Rolls with Spinach and Feta it looks very delicious and ahealthy recipe. Yummy, yummy, yummy.. :-). I cannot wait to try this and SHARE it to my friends. Thanks for this amazing recipes. I’ve been looking for a good zucchini snack for ages now! This looks perfect! I’m so glad I’ve found this recipe. Bookmarked!